Coolant touches every part of your process — machines, tools, product, and your people. It also touches the air in your shop and office . . .
. . . and it impacts your bottom line. Coolant Wizard’s Coolant Management System helps you manage your coolant by controlling the microorganisms that degrade your coolant and by removing tramp oil. Improve your shop’s efficiency; lower your coolant costs; and have a shop that smells better, too. CNC Industries initiates a coolant management program using the Coolant Wizard Senior, reducing coolant purchases by 90%. Utilizing a Coolant Wizard System, Techni-Cast, Corp. cuts coolant costs by 66% in a cost reduction and waste minimization program. Canfield Machine & Tool embarks on a coolant management program to reduce disposal and purchases of coolant while eliminating coolant related odors and operator skin problems. Wire Maid Manufacturing embarks on a coolant management program doubling coolant life and improving their machining process. X-Rite solves a growing dermatitis problem and reduces machine downtime required to clean sumps. 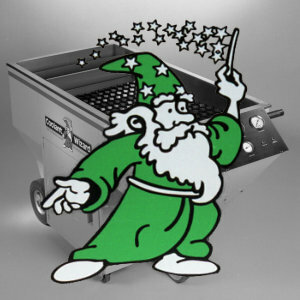 Coolant cost and disposal is reduced by over 50% using the Coolant Wizard. Check out the Coolant Wizard video of a couple guys watching the Coolant Wizard video.